For our SPECIAL OFFER $30 and $50 donation options please scroll down. 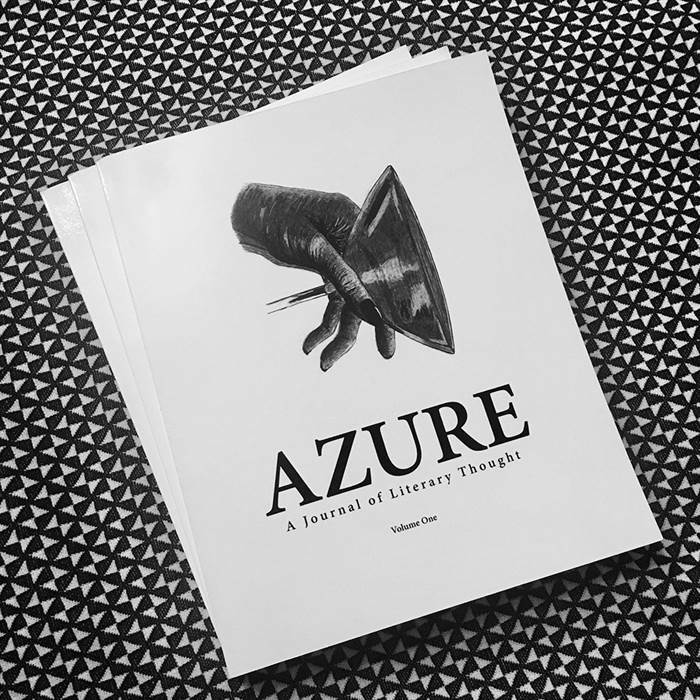 || AZURE: A Journal of Literary Thought is an online quarterly and an annual print anthology. AZURE publishes emerging writers selected from an international cohort through a blind submissions process. We contribute to literary democracy by supporting underrepresented styles by writers who create literary, lyrical, dense, experimental and witty reading experiences! The journal, founded in 2015, features unusual intersections of philosophy, literary fiction and social inquiry. Thus far AZURE has published American writers, international authors from Australia, Bosnia, Brazil, England, Canada, United Arab Emirates, and works from writers who work across borders (US/Uruguay, US/Mexico). We are particularly drawn to writing that broadens the concept of “literary” to one that is about the dexterity of language and the ability to pull from a global pedigree of literary and storytelling technique. We delight in the magic of unusual settings and experimentation in language and form that is left unpolished and raw. At a time when "facts" are so readily available through technological means, it is no longer necessary to invent a solution when you can "search" for one. In this context, the ability to imagine as a form of agency becomes paramount. We believe the value of creative writing and narrative fiction as tools to engage with social opinions, histories, and moral codes is vital to personal, political and social evolution. On the level of craft, we advocate creative writing's ability to reveal interiority and its ability to transform, heal and act as a catalyst for the full self-actualization of individuals and society. Aesthetically, we love work that is explicitly demanding of the reader linguistically, intellectually and emotionally. AZURE: A Journal of Literary Thought, co-founded and co-edited by Diana McClure and Sakina B. Fakhri, is a project of Lazuli Literary Group. We are based in Brooklyn and every piece we publish is paired with a custom illustration by illustrator, Evgenia Barsheva. We have a lot of fun collaborating on a platform rich in literary intersectionality. Your support as writers, readers, and financial stakeholders makes Lazuli Literary Group sustainable. "It's important to maintain that rawness in the writing. It's pretty clear that this is an avante garde publishing experience and for writers who can craft sentences that don't make readers want to skim to the end, because we have no idea where it will go. So they're looking for a lot of innovation and most of the work that they publish taps into some philosophical element. They publish unique, cerebral empathetic work. They are looking for submissions of things they have not imagined before. They are looking for finished work." Thank you for your inspiring support! Please note: Donations of $250 or more are tax deductible and will receive a letter for your tax records.